It's never good to mess up in front of the big boss. While the drivers were on their formation lap in China, BBC Radio 5 live's Tom Clarkson commented on air: "The pressure is on Ferrari. Their president, Sergio Marchionne, is watching here in person. It's a big race." Less than two minutes later, the red cars were crashing into each other. Oops. Cue an awkward silence and much shuffling in the team garage. Four-time world champion Sebastian Vettel was quickly on the team radio, blaming Red Bull's Daniil Kvyat for coming up the inside like a "madman" and, allegedly, forcing him into Kimi Raikkonen. After the race he was back on the wireless, describing the Russian's move as "suicidal". Was he overcompensating because he felt a bit embarrassed? Daniil Kvyat came out of the first-corner incident involving him, Sebastian Vettel and Kimi Raikkonen unscathed - but was he to blame for the Ferraris colliding? You see, crashing into your team-mate is the biggest no-no in Formula 1 and whenever it happens, repercussions and recriminations inevitably follow. Vettel - a four-time champion, no less - has been here before, colliding with then Red Bull team-mate Mark Webber at Turkey in 2010 when they were running first and second. The German was eliminated on the spot and walked away pointing his finger to his head while twirling it around, suggesting he thought the Australian was crazy. For his part, Webber said: "We'll probably have a difference of opinion until we go to our graves." 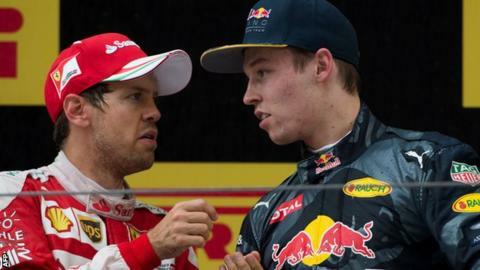 In China six years on, while the collision was between two Ferraris, the argument was between Vettel and Kvyat and we were able to to eavesdrop on their very entertaining cross words in the waiting room before the podium ceremony. Kvyat, with a knowing glint in his eye, knowing full well how angry Vettel was, gently dropped the bait into the water by asking: "What happened at the start?" Vettel swallowed it hook, line and sinker: "You - asking what happened at the start?! If I don't go left, you crash into us and we all three go out - you are like a torpedo." A laughing Kvyat responded: "That's racing," and added: "We didn't crash." To which Vettel replied: "You didn't. You were lucky this time." Kvyat shrugged: "I'm on the podium; you're on the podium." In the post-race interviews, Kvyat added: "You see the gap, you go for it on the inside. You see one car, it is hard to see both. It was a risky move - I agree with Seb - but you have to take risks and I am on the podium." While assessing where any blame lies, it's worth nothing the stewards took no action. In fact, they didn't even consider it worthy of investigation. So, in their opinion, it was very much a racing incident. And for Kvyat, his "torpedo" move paid off spectacularly, lifting him into third place, which is where he would finish the race. It was also hugely important for the 21-year-old, with rumours his seat at Red Bull is under threat and following a qualifying in which team-mate Daniel Ricciardo beat him by four places and more than four tenths of a second. Luckily for Ferrari, both Vettel and Raikkonen were able to continue and eventually crossed the line second and fifth respectively. So all's well that ends well. Well, kind of. Marchionne was not happy, telling Sky Sports: "This is the first time that the two drivers have ever collided and it isn't something you usually see with Ferrari. I'm more embarrassed for them than me, if I'm honest. "They know how to fix the problems though and it was an oversight that we paid for, but the comeback was a masterpiece so I'm happy about that." Just don't do it again, lads. Arguably the most famous example of team-mates clashing on the circuit. Alain Prost and Ayrton Senna came together during the 1989 Japanese Grand Prix. Prost retired while Senna was able to restart, but was later disqualified, effectively ensuring the Frenchman would win the world title.